“The quest to develop ever-faster and more powerful computers has led to one of the most rudimentary methods of counting being given a 21st century make-over. 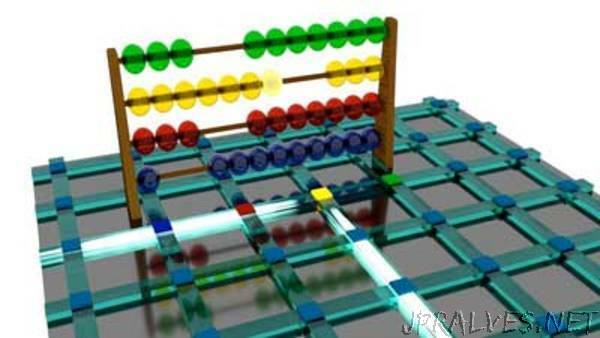 An international team of researchers, including Professor C. David Wright from the University of Exeter, have developed a nanoscale optical ‘abacus’ – which uses light signals to perform arithmetic computations. The innovative device works by counting pulses of light – much in the same way beads are used to count when using a conventional abacus - before storing the data. This pioneering new technique could pave the way to new, more powerful computers that combine computing and storage functions in one element – a move away from conventional computers that treat these two functions as separate. Prof. C David Wright, an expert in electronic engineering and co-author of the study said: “This device is able to carry out all the basic functions you’d associate with the traditional abacus – addition, subtraction, multiplication and division – but what’s more it can do this using picosecond (one-thousandth of a billionth of a second) light pulses”. The team’s optical abacus, which is so small it’s essentially invisible to the naked eye, is installed on a photonic microchip that can be easily manufactured. So far, the researchers have succeeded in calculating with two-digit numbers using two photonic phase-change cells, but the extension to large multi-digit numbers simply involves the use of more cells.